Raccordo per poter utilizzare le Web Cam sul telescopio CORONADO PST diametro 31,8, va bene anche per telescopi con pari diametro. Indicato per telescopi Newtoniani che hanno poca corsa di fuoco. A differenza degli altri raccordi questo non ha la battuta quindi fa avvicinare il sensore della web cam al fuoco dello strumento, il PST avendo una bassa escursione del focheggiatore con i raccordi tradizionali non arriva a mettere a fuoco, lo stesso per diversi telescopi consumer o entry level Newtoniani. Incorpora la classica filettatura filtri oculari per l'inserimento del filtro IR/UV Cut o altri. Connection for using the Web Cam on the telescope CORONADO PST diameter 31,8, goes well also for telescopes with equal diameter. Indicated for Newtonian telescopes that they have little fire race. With the exception of the other connections this does not have the struck one therefore ago to approach the sensor of the web cam the fire of the instrument, the PST having one low excursion of the focuses with the traditional connections does not succeed in to put to fire, the same one for various Newtonian telescopes consumer or entry level. 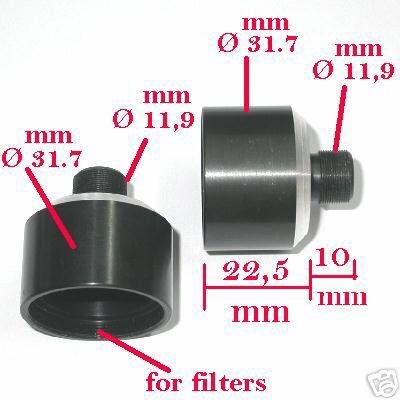 It incorporates the classic thread ocular filters for the insertion of filter IR/UV Cut or others.